CHAMPIONSHIP SUNDAY: One nice thing about a postseason devoid of upsets is that when you reach this stage– the Championship Game stage– you have the juiciest matchups imaginable. Such is the case this year, as the top two seeds in both conferences have advanced and will meet on Sunday with nothing less than a trip to the Super Bowl on the line. 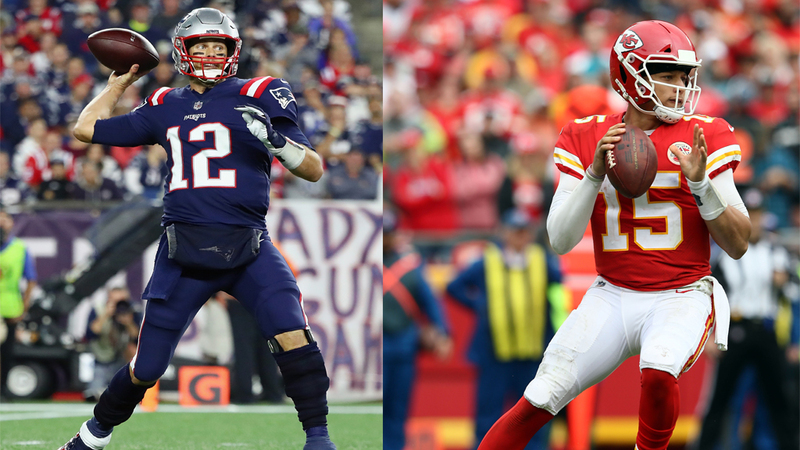 In the AFC, the 1-seed Chiefs will host the 2-seed Patriots, who are making their eighth consecutive appearance in this game. Eight straight AFC Championship games. Let’s take a moment to marvel at that. A streak totally unprecedented in the history of the NFL, a league that is structured to promote parity and an “any team can win it” feel— from the draft rules to the waiver system and salary cap (and floor), the NFL makes it as difficult as possible for a franchise to sustain success for as long as New England has. It’s remarkable. That said, the Pats are an underdog this week, and they should be– Kansas City was the conference’s best team throughout the regular season, and Arrowhead Stadium is one of the toughest places to play in the NFL. Still… we’re talking about the Brady/Belichick Patriots here. Your can see why both sides are drawing plenty of action. The NFC Championship game should be just as good, as the Saints and Rams have been the top two teams in the conference all season and are two of the league’s most exciting teams to watch. New Orleans took Round 1 back in Week 9, but the Rams certainly showed what they’re capable of in that game, reeling off 21 straight points at one stretch to erase a 35-14 deficit and tie things up in the 4th quarter. We can expect similar fireworks this week, as both offenses are explosive, both coaches are aggressive play-callers, and neither quarterback is afraid to take shots downfield. Buckle up for a wild one in the Superdome. As expected when you see a total like 56.5, this game will feature plenty of offense. The Rams ranked second in the NFL in points scored this season, averaging 32.9 per game, while the Saints ranked third with 31.5 ppg. When these teams met in Week 9, they put up 80 combined points. It should be noted, however, that the New Orleans offense slowed down a bit towards the end of the season, failing to reach the 30-point mark in 5 of their past 6 games, including last week’s Divisional Round win over Philadelphia, after scoring 30+ in 9 of their first 11 contests. But the defense has more than made up for it, as a unit that began the season by giving up 48 points and 400+ passing yards to the Ryan Fitzpatrick-led Buccaneers has developed into one of the stingiest defenses in the league: the Saints have surrendered just 16.9 points per game since Week 7; they’ve sacked the opposing quarterback 28 times in that span; and they ranked second in the NFL against the run this season, limiting teams to 80.2 rushing yards per game and 3.6 yards per carry. In last week’s showdown with defending Super Bowl champion Philadelphia, the Saints D allowed two quick first-quarter touchdowns but then totally put the clamps on, blanking the Eagles the rest of the way and holding them to a mere 250 total yards for the game. They can’t expect that same level of success against the high-powered Rams this week, and the loss of defensive tackle Sheldon Rankins, who tore his Achilles in last week’s win, is certainly a blow, but I think the Saints can have a reasonable expectation of limiting the L.A. rushing attack, much in the same way they did back in Week 9, when Todd Gurley rushed for a relatively modest 68 yards on 13 carries. And if they can pressure Jared Goff, things could get a little dicey for the Rams: Goff’s performance tailed off bit towards the end of the season, as he’s totaled 216 passing yards or fewer in 5 of his past 6 outings, with a 6/5 TD-to-INT ratio in that span. I think it’s highly unlikely that he just suddenly snaps out of that funk to hang 390 passing yards on these Saints, like he did in Week 9. And as we saw in Chicago a month ago, pressure can really get Goff off-kilter, even more so than most QBs, maybe. The bigger problem for the Rams, however, is their defense. They were horrifically bad against the run this season, surrendering an NFL-worst 5.1 yards per rush, and though they were able to slow down Ezekiel Elliott last week, they did so by putting eight men in the box for much of the game. They will not be able to employ that strategy against Drew Brees, who broke his own NFL record for completion percentage this season and shredded these Rams to the tune of 346 yards and 4 touchdowns the first time around. This is a mountaintop moment for Brees: the 40-year old vet is just a win away from another Super Bowl, and he’s playing at home, in the Superdome, where he’s been so magical over the years. Going up against a vulnerable L.A. defense, you just know he’s going to light it up. I can’t bet against the Saints in this situation, and I wouldn’t advise you to, either. Just when you think New England’s reign in the AFC and incredible streak of AFC Championship Game appearances is about to come to an end, as, admittedly, I did last week, you are given a clear reminder of who and what you are dealing with. This is greatness at a historic level, and when Tom Brady comprehensively took apart the Chargers defense last week, throwing for 343 yards and guiding the Pats to a 35-7 2nd-quarter lead before Philip Rivers could even catch his breath, it had to make even the most jaded skeptic and “age-related decline” promoter shake his head in amazement. And if you’re not expecting Brady to similarly dissect the Kansas City defense this week, you’re a fool. Simple as that. Use whatever adjective you want to describe this Chiefs defense– leaky, vulnerable, porous, generous, exploitable… you get the idea. They ranked 31st (next-to-last) in the NFL in both total yards allowed and pass yards allowed this season, and they’re atrocious against the run as well, surrendering better than 5 yards per carry. There aren’t many bright spots. But the Chiefs have more than made up for the holes in their defense with the brilliance of the offense, a unit that led the league in both yards per game and points scored (35.3 ppg) in 2018 and made quick work of a solid Colts defense last week, scoring 31 points— 24 in the first half— and racking up 433 total yards. Patrick Mahomes has been a revelation in his first year as the starting quarterback, throwing a remarkable 50 touchdown passes and just 12 interceptions while averaging 319 pass yards per game, the second-most in the NFL. Mahomes and the Chiefs are especially good at Arrowhead Stadium, where they’re 8-1 on the season and have an average margin of victory of over 14 points per game. For Brady, pulling off the upset here (and that’s a phrase that can rarely be used, as this is the first time since September of 2015 that a Brady-led Pats team has been the betting underdog) is one of the most formidable challenges of his storied career. He’ll be playing at one of the NFL’s toughest venues, a place he’s had trouble before, and he’ll be charged with outscoring the NFL’s best offense, a group that scored 26 points or more in every game this season. When these teams met back in Week 6, it was an epic battle, with the Patriots racing out to a 24-9 halftime lead before the Chiefs came roaring back in the second half, taking the lead at one point but eventually losing 43-40. The teams generated 946 combined yards of offense, and both quarterbacks threw for at least 340 yards despite neither attempting more than 36 passes. Earlier in the week there were predictions of harsh winter weather, but those have dissipated over the past couple of days and, as I type this, fairly mild conditions are expected: temps around freezing, but no precipitation and light winds, so the quarterbacks shouldn’t be too affected. And that’s what this game will be, a duel between one of the great QBs the league ever seen and a young upstart fresh off a historic season that will likely earn him his first MVP award. Both offenses had it humming last week, and the last time these teams played we saw video game-like numbers, despite the Kansas City offense getting off to a slow start. I’m not entirely sure who’s going to win this game, but I know one thing: there will be a lot of points scored. Gimme the over.